To Cite: Sohrabi A, Rafighi A, Moslemzadeh S H, Foroughi Moghaddam S, Rasouli F. Comparison of Two Different Retention Techniques on Re-Opening of Extraction Space at Different Intervals During the Retention Phase in Fixed Orthodontic Patients, Iran J Ortho. 2014 ; 9(3):e4854. doi: 10.17795/ijo-3747. Background: After completion of orthodontic treatment, the retention phase is necessary for premolar teeth to preserve them in an ideal esthetic and functional relationship and to counteract the inherent tendency of teeth to return to their previous positions. Different fixed and removable retainers are used to prevent relapse in the anterior segment of the dental arch. Retainers that are bonded to 6 anterior teeth, i.e. flexible spiral wires (FSW), are more commonly used. In addition, extended bonded retainers are used to keep the extraction space closed, which are bonded to premolars in addition to anterior teeth. In orthodontic treatments involving tooth extraction, the inability of retainers to prevent the re-opening of the extraction space will result in some periodontal and occlusion problems and patient dissatisfaction. Objectives: Therefore, the present study evaluated the ability of extended fixed retainers in comparison to FSW retainers, along with overnight use of removable retainers, to prevent re-opening of the extraction space. Patients and Methods: Thirty-one patients (60 quadrants) were included in this study after obtaining informed consent. Convenient sampling technique was use to assign patients to two group with 13 and 27 quadrants. In group 1, an extended fixed retainer (from the second premolar on one side to the second premolar on the other side) and in group 2 FSW retainer (from the canine tooth on one side to the canine tooth on the other side) in association with overnight use of Hawley plaque were administered. Opening of the interdental space was evaluated by measuring the distance between the mandibular second premolar and first molar on each side in both groups using a leaf gauge at baseline and 2 and 6 months after placing the retainers in the oral cavity. Wilcoxon’s test was used to compare the spaces between the mandibular second premolar and first molar in each group at each time interval. Mann-Whitney U test was used to compare changes in interdental spaces between the two retainer types. 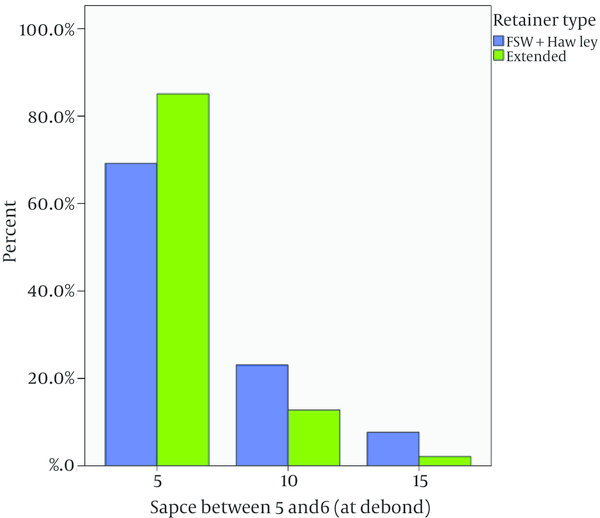 Results: The interdental spaces decreased from the time of debonding up to two months after debonding, which was statistically significant in the FSW + Hawley group (P = 0.21). During the next 4 months, the space remained unchanged in the extended FSW group and slightly increased in the FSW + Hawley group, which was not significant. In general, the interdental space decreased from the debonding session up to six months later, which was not statistically significant (P = 0.91). Conclusions: Both extended fixed retainer and fixed retainer in association with the overnight use of Hawley restrainer were successful in keeping the extraction space closed in fixed orthodontic patients during the first 6 months. After moving teeth during orthodontic treatment the teeth might end up in an unstable position and have a tendency to return to their position before treatment (1). After completion of orthodontic treatment, the retention phase is mandatory to preserve the teeth in an ideal esthetic and functional relationship and to prevent their inherent tendency to return to their original position (2). In addition, during the retention phase changes occur at occlusal contacts and depending on the retainer used, the teeth are settled (3, 4). Stabilization of the results achieved with orthodontic treatment and preservation of teeth in their corrected position after orthodontic treatment is still a challenge (5). Different types of fixed and removable retainers are used to prevent relapse in the anterior segment of the dental arch. Two types of fixed retainers used for the mandibular anterior teeth are 3-3 retainer, which is only bonded to the canine teeth (6) and retainers that are bonded to 6 anterior teeth, of which the flexible spiral wire (FSW) retainer is the most commonly used one (7). In addition, extended retainers, too, are used to keep the extraction space closed, which are bonded to premolars in addition to the anterior teeth. Several studies have been carried out on different aspects of success or failure of fixed retainers, the possible factors responsible for failure have been reported, including bond failure, the possibility of tooth movement due to deformation or the wire not being passive (8), accumulation of plaque and calculi and periodontal problems (inflammation, gingival recession and loss of periodontal attachments) (4), dental caries (9) and the relapse of malalignment of anterior teeth (10-12). In addition, in some cases displacement and change in the inclination of mandibular canines have been reported (7). To preserve the alignment of teeth a fixed canine-to-canine lingual bar can be manufactured with the use of a heavy 28 to 30 mil steel wire. In addition, a lighter 17.5 steel braided wire can be used, which is bonded to all the teeth (flexible spiral wire). This type of retainer is suitable for severity rotated teeth (13). In 2007, Katsaros et al. followed patients who had used FSW for retention for 3 years and reported that the FSW retainers bonded to 6 anterior teeth might result in un-planned-for movements in anterior teeth, necessitating retreatment (7). In 2008, Booth et al. evaluated patients who had been treated with permanent canine-to-canine retainers for 20 years. Sixty patients were recalled and evaluated. The results showed that long-term retention for keeping the mandibular incisors aligned was acceptable for the majority of patients and was compatible with the periodontal tissues (11). In orthodontic treatment involving tooth extractions, if the retainer is unable to prevent re-opening of the extraction space, re-opening of this space in this area of the dental arch will create problem such as periodontal and occlusal problems and will give rise to patient dissatisfaction. Such re-opening of space is considered a failure in preservation of the results of treatment and retention, necessitating retreatment in some cases. A literature review did not reveal any data to show to what extent the use of fixed retainers can prevent re-opening of the extraction space. The aim of the present study was to evaluate the ability of extended fixed retainers, in comparison to fixed retainers in association with the overnight use of removable retainers, to prevent re-opening of extraction space. In the present study the subjects consisted of patients who had undergone comprehensive orthodontic treatment involving the extraction of mandibular first premolars in the private orthodontic clinic of the authors and had completed their treatment. A total of 31 patients were included in the study after obtaining informed consent Figure 1. The patients were matched in relation to age, gender, the type of malocclusion and the severity of crowding and assigned to groups with 13 and 47 quadrants in groups 1 and 2, respectively. In group 1, the extended fixed retainer (from the second premolar on one side to the second premolar on the other side) and in group 2, a fixed retainer (from the canine on one side to the canine on the other side) in association with the overnight use of Hawley plaque were used. • Achievement of optimal occlusion to remove the fixed appliances. • Extraction of teeth other than the mandibular first premolars. • A report indicating not using the retainer. At the end of treatment and before removal of the brackets, alginate impressions were taken from the mandible using Tropicalgin alginate impression material (Zhermack, Ravingo, Italy) and the retainers were manufactured on stone casts. The fixed retainers were fixed with twisted stainless steel 0.0175 wire (ORTHO-Organizers) and bonded on the lingual surfaces of the teeth with TransbondR LR composition resin (3M Unitek, Monrovia, USA) using the direct technique by an experienced restorative specialist. The Hawley removable retainer, consisting of the occlusal rest and the labial bow, was fabricated on first premolar teeth with 28 mil SS (Dentaurum, Germany) and self-cured acrylic resin. The time interval between impression taking and placement of retainers was a maximum of one week. The retainers were placed immediately after removal of the brackets. The variable evaluated was re-opening of the interdental space. This variable was determined using a leaf gauge to measure the distance between the second premolar and first molar on both sides of the mandible in both groups in the patients’ oral cavities Figure 2. In group 2 (FSW in association with Hawley retainer) the distance between the canine tooth and the second premolar was also measured. To make sure of the accuracy of measurements, in a pilot study the distances were measured in 10 samples by two researchers and the ICC was calculated at 0.93. The measurements were made at 0, two-month and six-month intervals after placement of the retainers in the oral cavity. A pilot study was carried out to determine the sample size. The standard deviation of the space between the mandibular second premolar and the molar during the debonding session was calculated at 0.036 mm. Statistical significance level was set at 0.5 mm. The number of quadrants necessary was calculated at 11, using the formula to determine the sample size to compare two means by considering α = 0.05 study power = 80%. However, to accommodate the samples possibly lost during the study and to increase the power of the study, 13 quadrants were included in each group. The samples were collected using the available samples method. In the present study, 60 cases were evaluated, i.e. each quadrant was considered a case. FSW was used in association with Hawley retainer in 13 cases and extended fixed retainers were used in 47 cases. Data were analyzed with SPSS 19. First, the descriptive parameters were calculated in each group. Wilcoxon’s test was used to compare the space between mandibular second premolars and first molars in each group and at each time interval. Mann-Whitney U test was used to compare changes in interdental spaces between the two retainers. The acceptable type II error level was 0.05 in this study. In the present study, 31 patients were assigned to two groups: extended fixed retainer and fixed retainer + Hawley retainer. Twelve quadrants were evaluated in males and 48 quadrants were evaluated in females. Fourteen quadrants belonged to subjects under 15 years of age, with 8 in subjects over 25 and 38 in subjects 15 - 25 years of age. Fisher’s exact test showed no significant differences in gender distribution between the two retainer groups (P = 0.488). Chi-squared test showed a similar pattern of age distribution between the two groups (P = 0.107). In addition, chi-squared test showed a homogeneous distribution of crowding, as a confounding factor, eliminating its effect on the results of the study (P = 0.157) (Table 1). The interdental spaces between the second premolar and first molars were determined at three time intervals: the debonding day and two and six months after debonding. Kolmogorov-Smirnov test showed non-normal distribution of spaces in the two groups at the three time intervals evaluated. Figure 3 presents the descriptive data of the interdental spaces on the debonding day separately for each group. The changes in interdental spaces were determined from the debonding day up to two months after debonding and also six months after debonding and compared between the two groups. Positive values indicated an increase in the distance and negative values indicated a decrease in the distance between the teeth. The descriptive data of changes in interdental spaces at different time intervals are presented in Tables 2 to 4 separately in each retainer group. aAll the samples exhibited a fixed value of 0. A total of 60 interdental spaces were evaluated at three time intervals: the debonding day and at 2- and 6-month intervals after debonding. On the debonding day, there were no significant differences in the means of distances between the second premolars and first molars (Z = -1.33, P = 0.182). The same trend was observed at 2- and 6-month intervals. The changes in the interdental spaces from the debonding day up to 2-month interval and from the debonding day up to the 6-month interval were compared between the two groups. From the debonding day up to the 2-month interval the interdental spaces increased, which was significant in the FSW + Hawley group (Z = -2.30, P = 0.022). However, since the significance level of decrease in interdental spaces had been defined at 0.5 mm clinically, such a decrease in the interdental space was not considered significant clinically. 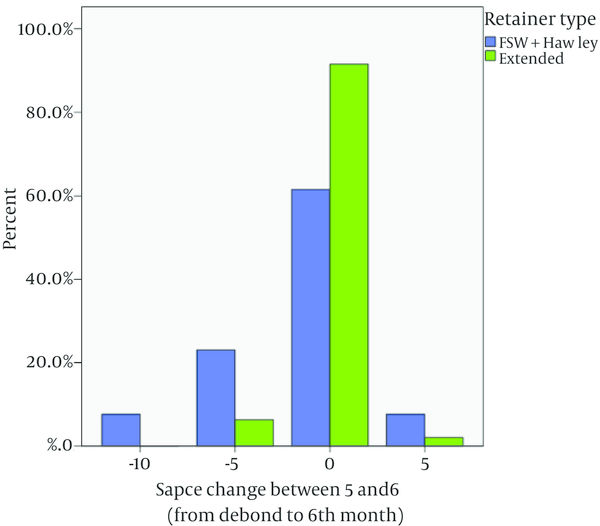 During the next 4 months the interdental spaces in the extended FSW group did not change but they increased slightly in the FSW + Hawley group, which was not significant (Z = -1.95, P = 0.051). Therefore, during these two intervals, from debonding up to six months, the interdental spaces decreased; however, the differences were not significant (Z = -1.69, P = 0.091). Figure 4 presents the frequency distributions of changes in interdental spaces from the bonding day up to six months after debonding separately in each group. There is famous saying among the athletes that it is easy to because a champion but it is not easy to remain a champion. From the early days of orthodontic science, relapse of the results of treatment over time has been one of the main themes for discussion and retention and preservation of the results have been the main concern of orthodontists. Different reasons have been reported for the relapse and the necessity for retention, including re-organization of gingival and periodontal tissues after tooth movements, moving the teeth to an unstable position and the continuation of growth. Continuation of skeletal growth not only affects the occlusal relationships but also can change the position of teeth. For example, if the mandible moves forwards or rotates downwards, the lower incisors will move toward the lip, resulting in a force that will give rise to distal tipping of these teeth. 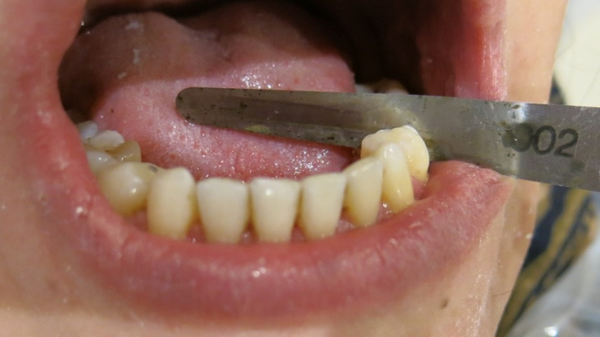 This problem is particularly evident in patients with Cl III malocclusion and skeletal open bite. In most cases it is recommended that retention should continue until the eruption of the wisdom teeth, although the theory of the effect of the pressure of the developing wisdom tooth on the crowding of lower incisors does not appear to be correct. Nonetheless, it seems logical to continue retention until the eruption or extraction of wisdom teeth, which occurs during the late stages of the second decade. In the majority of adults, both those who have undergone orthodontic treatment and those who have had correctly aligned teeth from the beginning and have never received orthodontic treatment, a slight crowding is normally expected with aging, and such a problem is observed even in those who have extracted their premolars during orthodontic treatment. It appears the delayed growth of the mandible is the most important factor involved in the tendency to create crowding. Therefore, it is important to preserve the alignment of lower incisors until the growth of the mandible decreases to the base level observed in adults. Various appliances, techniques and protocols have been introduced for retention. Generally, removable and fixed appliances can be used for retention. Hawley retainer is the most common removable retainer, which was introduced in 1920 as an active removable appliance. Fixed bonded retainers are used in cases in which here is intra-arch instability and long-term retention is considered. FSW is one of the most commonly used fixed retainers. To this end, usually a flexible wire is bonded in the lower incisor area to the lingual aspects of 6 anterior teeth. However, in cases in which the first premolars have been extracted, the wire can be extended up to the second premolars (extended FSW) to prevent re-opening of the extraction space. Little et al. evaluated changes in anterior teeth and preservation of their alignment after the retention period and concluded that the arch compression trend that is effective in the crowding of anterior teeth continues after the completion of active growth. Therefore, clear changes are seen after the retention period (14). Sinclair et al. reported in a study entitled ‘Development and Maturation of Normal Untreated Occlusion’ that there is a continuous inclination for decreasing the arch length from the mixed dentition period until adulthood (15). 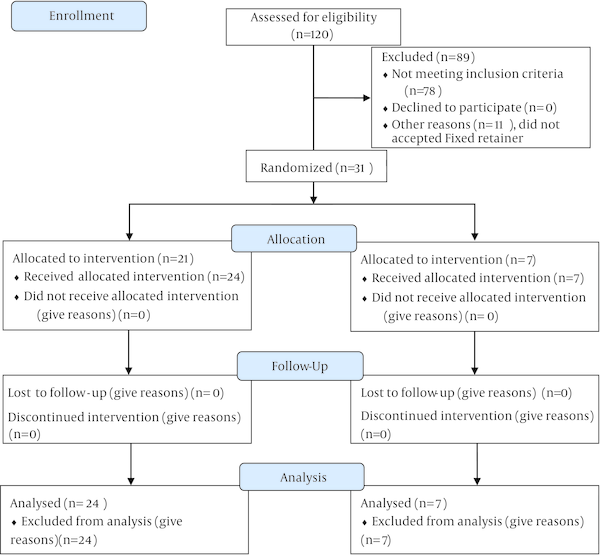 In the present study, two different types of retention were evaluated. In the first group, the extended fixed retainer (from the second premolar on one side to the second premolar on the other side) was used. In the second group, FSW retainer (from the canine tooth on one side to the canine tooth on the other side) in association with overnight wearing of Hawley plaque was used. Statistical analyses showed that both groups exhibited homogenous distributions of age, gender, crowding severity and the type of postero-anterior and vertical malocclusion and had proper matching. In addition, at baseline (the bonding day) there were no differences in interdental spaces of second premolars and first molars between the two groups. Therefore, the two groups were identical at baseline and could be compared, which made the results of the 2- and 6-month intervals highly valid. Comparison of the results showed that the interdental spaces decreased from the debonding day until the 2-month interval after debonding. Although the decrease in FSW + Hawley group was higher, the differences between the two groups were not clinically significant. In addition, the changes from the 2-month interval to the 6-month interval and from the debonding day to the 6-month interval were not clinically significant. Overall, the interdental spaces decreased from the debonding day up to the 6-month interval in both groups, which might be attributed to the possible inclinations of teeth to move mesially and compress and decrease the arch length from the mixed dentition period to adulthood, consistent with the results of studies by Little et al. (14) and Sinclair and Little (15). All these findings show the success of both retainers in preventing re-opening of spaces. On the other hand, since the aim of retainers is to preserve the alignment of teeth and prevent re-opening of interdental spaces, it can be concluded that both retainers were very successful in preventing re-opening of interdental spaces. • Both extended fixed retainer and fixed retainers in association with the overnight use of Hawley plaque were successful in preserving the closed space of extracted mandibular first premolar during the retention phase of fixed orthodontic patients during the first 6 months. Authors’ Contribution: Aydin Sohrabi was the supervisor of the present study as postgraduate thesis of Farzaneh Rasouli and Ali Rafighi, Seyed Hossein Moslemzadeh and Saeid Foroughi Moghaddam provide the required sample patients. Funding/Support: We appreciate Tabriz University of Medical Sciences, Deputy of Research and Technology for financial support of this study.